In this solo dining adventure, Gary returns to Bouchon Bakery, this time for a meal and not just dessert. Back in November 2009, JP and I did an afternoon-long eating tour that started in Chinatown for lunch and ended at Bouchon Bakery for dessert. Since that visit, my first, I’d been back several times, every since one of them for one of their delicious cookies. On and on, this would go, for about a year before I finally actually came here with the intention of sitting down in their dining area and having a meal here. The impetus for a proper meal here would come from – who else – JP. In town for the long Thanksgiving weekend, we thought it’d be a great place to have lunch with the wife and newborn son in tow. At least we thought it would be but, as it turns out, the layout isn’t really all that accommodating when it comes to a stroller. That, or maybe the hostess just didn’t know what to do with it. Whatever the reason, having to be seated in a particular section to fit the stroller, coupled with the usual busy weekend business equaled us waiting well over an hour before we were seated. Once seated though, it was all good from there on out. Lunch began with their excellent bread, the same as that of big sibling Bouchon, which I may or may not have spent some time praising during my visit there (okay, I did). 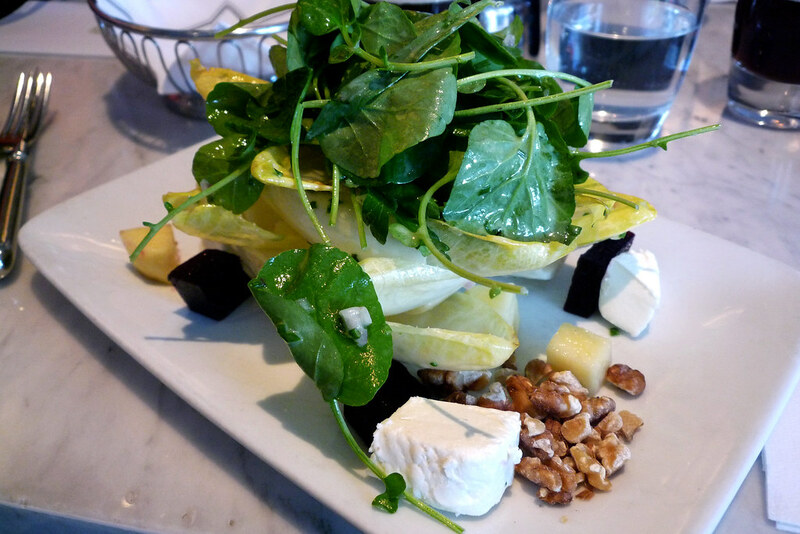 Knowing that dinner later that night would likely be very filling, I decided to go light here, opting for the Watercress Endive Salad. It’s got watercress leaves, Belgian endive, candied walnuts, roasted beets, goat cheese, and Fuji apples, then dressed with a walnut vinaigrette. I’m a sucker for a well-dressed salad and this most certainly fits the bill. From the photo above, you can barely tell that there’s even any dressing but, trust me, it’s there and the minimal dressing keeps the watercress and, more importantly, the endive from becoming soggy. Goat cheese and roasted beets, I’ve found, always go great together. The little dressing remaining on the plate at the end? Well, that’s what the bread is for! I do very much love Bouchon Bakery. My meal here, while minimal, was excellent and I’m a big fan of their sweet treats, which we made sure to get from their retail section on our way out of the Time Warner Center. My only regret is that I had my first meal here after Ad Hoc and Bouchon, which just made the Bakery pale by comparison. A sad thing, yes, but if this is all the Keller I can get in New York City – at least until I can afford Per Se! – this is a fine option to have. 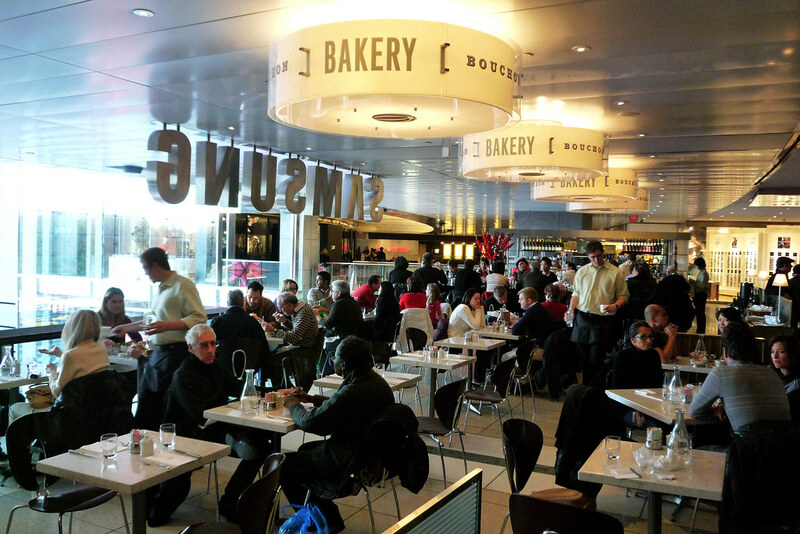 Bouchon Bakery. 10 Columbus Circle, New York, NY 10019. [Show/Hide Map] (212) 823-9364.